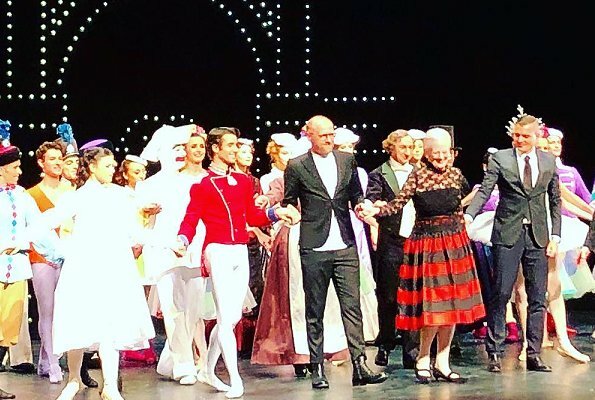 On November 23, Queen Margrethe and Princess Benedikte attended the premiere of The Nutcracker Ballet performed at Tivoli Ballet Theatre in Copenhagen. 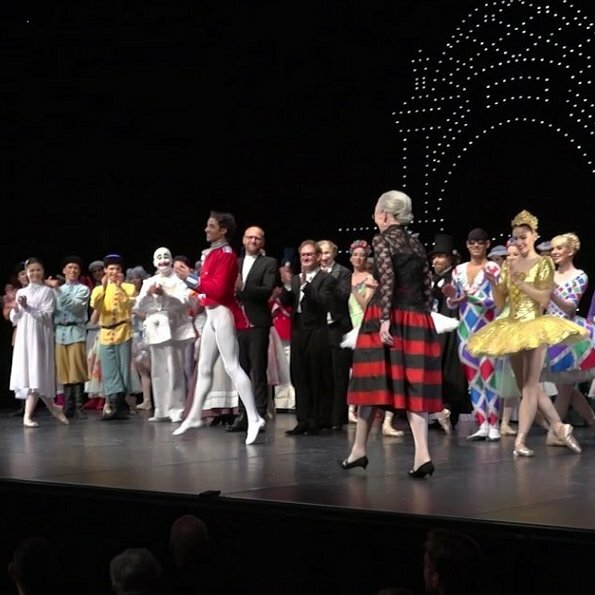 The Queen appeared on stage during curtain call at the premiere of The Nutcracker Ballet. The Queen is the production and costume designer of this version of Tchaikovsky's The Nutcracker. The ballet which is also for children is a revival from 2016 and plays through December 2018. 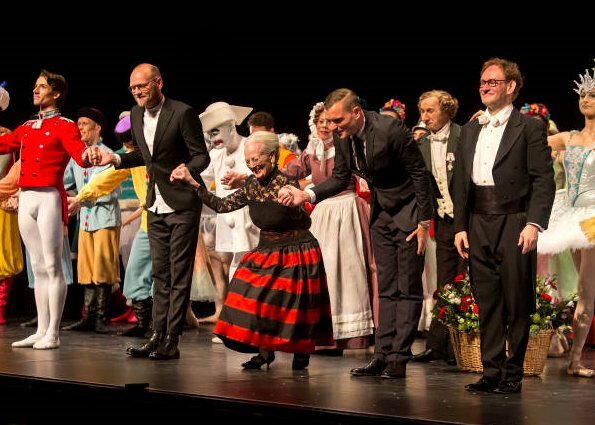 Queen Margrethe is the expert behind the performance and costumes which will form a frame for Peter Bo Bendixen's choreography. Your dislike of horizontal stripes is a personal dislike. There is a way to wear them successfully. It depends on the width, color and placement on the garment. Vertical stripes can end up looking like a circus tent if not done properly. If you have a good designer, you will have a beautiful garment. I know when I was younger, it was one of the "fashion rules" that horizontal stripes made you look wider. It is hard to get those rules out of our heads sometimes. Hi, chardonn8r -- personal likes and dislikes are pretty much what comments here are all about :-). I don't think that fashion "rules" are set in stone; there will always be individuals who manage to be sartorial mavericks and make it work for them. That said, I think that horizontal stripes acquired a reputation for making people look wider because that is what horizontal stripes actually tend to do. What is clear from the comments here is that many people find horizontal stripes charming, at least in some cases. It's ok to agree to disagree. No ill intent meant. Indeed, horizontal stripes do have a bad reputation. I find they don't deserve the bad reputation they have when a good designer uses them well. Other times, of course, they are the mistake they can often times be. We all have our likes and dislikes, that is for sure! Not sure if this is a dress or skirt and top. I hope it is a skirt as it would be so much better with a solid black top. If it is a dress, it is just not good. Also, wish her shoes were low pumps as these are too much of a little-girl style. Being so creative and talented herself, it’s not surprising that such expressions of creativity interests her. She is is probably one of the most interesting, intelligent and regal royal women around. Wonderful display of the Queen's talent for designing, and a textbook curtsy to her audience. Bravo! Her dress is a pretty combination of what seems to be taffeta and lace. In this dress Margarethe fits very good into the ensemble! I like her very much! We do not "quibble" over shoes, socks, dress, etc. We give our opinion on fashion since that is what this website is about. Margrethe may have a lovely personality and her country may love her, which is great! I really like the skirt and do not mind the horizontal stripes, but I do agree with the previous comment that a solid black top would have been better. Great stuff Queen Margarethe! Love that she has these creative intellectual pursuits. I think she looks fabulous here. Not a fan of the Queens outfit,but her talent for the costume design's is great. She looks very happy and that is more important then anything else. Oh - this is simply wonderful. It shows such a sense of fun that we all need. Perfectl in every way. And I like her quirky style tonight, percect fitting in to the event. Is she wearing a costume? part of the Nutcracker play? otherwise, terrible outfit! And those awful FUR coats. Princess Benedikte looks good. Koningin Margrethe en Prinses Benedikte: grandioos! 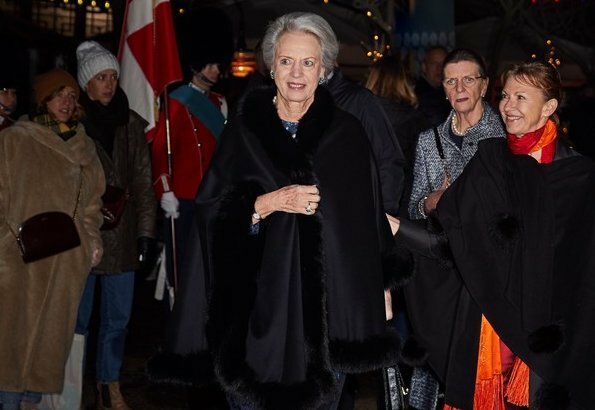 Princess Benedikte is always chic and classy . The Queen has her own lovely style. 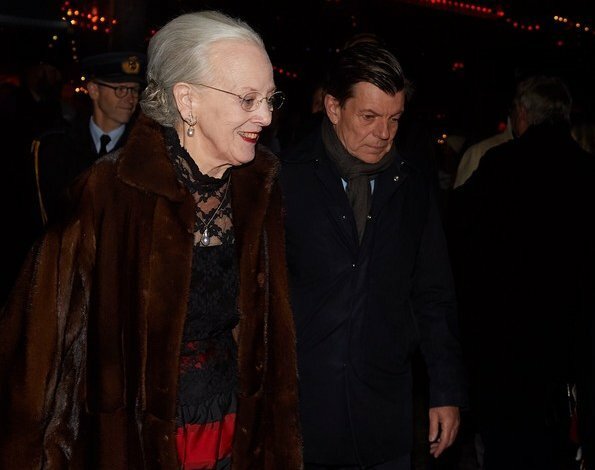 Someone needs to let the Danish royals know that (even if old and around for a while) wearing real fur in this dramatic quantities is not giving them a favourable image. They look insensitive and out of touch. It may have been the opulent, high class option centuries and even decades ago, but times have changed. It screams ‘I don’t care’ as loud as some now famous Zara jackets. I have a lot of admiration for the Danish royals, but on this one I give them two thumbs down. What would you do if you would own those fur coats in your wardrobe for decades? Throw them away? Give them to the homeless? 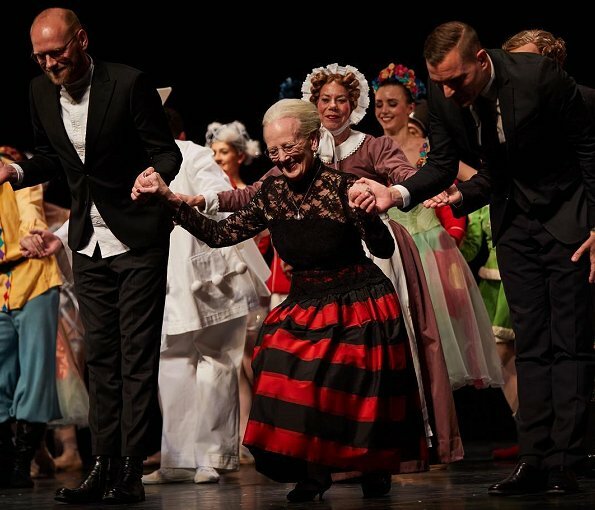 Queen Margrethe is such a happy soul. The dress is so in keeping with the Nutcracker style. 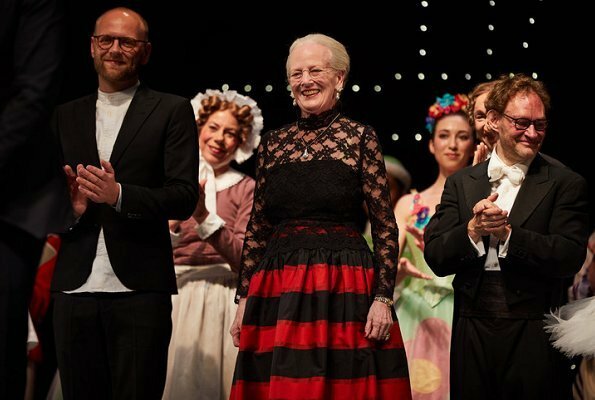 Margrethe is so girlish;I love her.